The theme weeks are upon us! Well, at least they're easing us in with Movie Week and there's no scary guest judge in the shape of Donny Osmond this year. Although we did have the utterly surreal opening, where the contestants were used as human props like some sort of moving Madame Tussaud's. Pasha in uniform alert! It isn't quite Gethin proportions, but I'll take what I can get in Movie Week. I was not expecting anything much from Carol doing a quickstep, it's hard enough for anyone to do that dance so early - but I definitely saw some improvement. 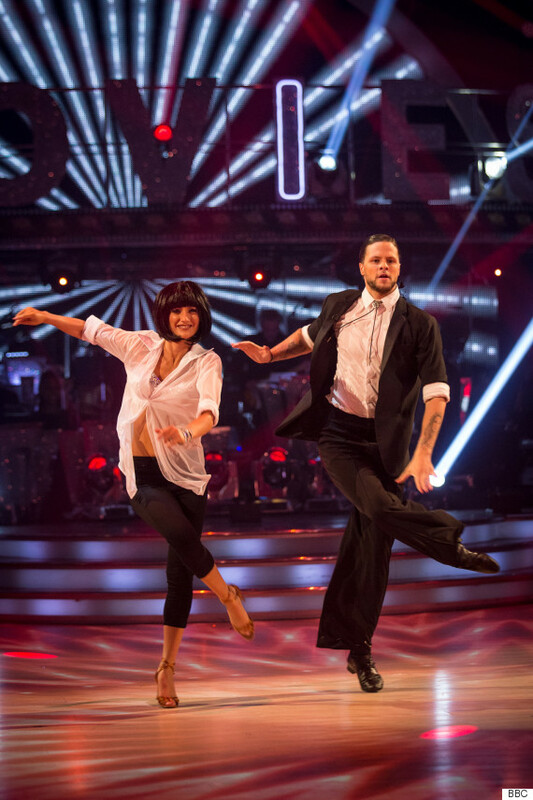 Also, props to Pasha for doing a pretty normal quickstep rather than anything too gimmicky. Poor Carol. I thought this was a significant improvement on her efforts in the previous two weeks. The fact that she scored less for it made me sad. It actually had quite a lot of quickstep in it. And yes, in parts she was being dragged about like Linus' security blanket, but she was performing it more too. One extra point wouldn't have gone amiss. Just saying. This didn't have to be a Movie Week special, what with all the take-your-partner-to-work faffing about they've done this year. I can't comment too much on his paso-ing, because I was mainly looking at a) his arm and b) Oti being absolutely amazing at the paso! He did actually look like he was in pain, but it was pretty stompy. Although he was working very hard, and we love a hard worker, I want him to stay so he has a chance to get better. Slightly upset to see Katie hasn't gone for thigh-high PVC boots look, but there's no going back to the Proms after that. After two show-stopping first dances, this was a bit of a letdown as a pretty run-of-the-mill cha cha. And then Anton went on and on for about a year on choreography, I don't like props but I think they missed him having a MASSIVE Richard Gere mobile phone. Here we go. I was kind of hoping Anton would step up a Gere (boom boom) but this highlighted issues with him, rather than Katie. We know he's not a latin man, but most of that choreography was a world of horrid (although I liked to see it being danced on 2 and to see some recognisable basics.) To be fair, several of last week's latin dances consisted of very little more than strutting about, but I think the disappointment lay with the fact that the public has really been behind these two. I'm pleased Anton took the blame for the choreography, something he didn't seem to grasp years ago when he was dancing with Laila. Anton, I implore you not to give up and start hamming it to stay in. Study, work every hour there is and create routines for Katie that are worthy of her. Don't do it again, man. Well this was delightfully bonkers. I was willing to give it a go, since the Cantina song is absolutely perfect for a Charleston, and will now be humming it until at least Christmas. She had great swivel, kept up with Kevin and it was prime eyes and teeth material. I could have maybe done with a bit more energy in the lifts, but Kellie's best dance so far, easily. Those costumes scare me, it's like an odd halfway house between dance wear and fancy dress, is this a microcosm of all that is wrong with theme weeks? Saying that, Natalie is a choreography genius to have that foisted on her and still make it look like a cha cha! Also, amazing song, obviously, and that will take you halfway there in a cha cha. Ainsley is turning into a bit of a hot mess though, I'm hoping he gets some restrained ballroom next. I love these two. But I hated this dance with a passion worthy of a 19th Century gothic novel. To me, she didn't quite manage to make it look like a cha cha, though I imagine that was one huge ask. Ainsley's natural musicality didn't help him when it came to dancing the parts that actually were based on cha cha. But this is where Natalie's utter genius kicked in. I don't know whether it was on purpose or not, but when he pickled up the first cha cha sequence on 2, she seemed to switch to match him dancing on the 1 later on in the routine. That is called adapting to your partner's needs. Bravo, Nat. Raunchy rumba alert, James Bond Cliches alert! They rolled everything into that VT, although Georgia being super-northern livened it up to no end. This had flashes of greatness, especially for such an early rumba, but she didn't seem to remember to use her hips all the time. I reckon if she got to do it again in a final or something it could be amazing. Also, this could have come from any week, so :P to you, Movie Week. A what is now all-too-usual lack of actual rumba. The term just seems to cover 'any slow sort of dance' on the show now. I would have liked to have seen more steps and less posing. I would have liked to have seen some footwork, technique and body movement. She wiggled but it wasn't from the feet. We all know what Ms, Hardy says. But alas, non. What they did was OK but I'm reluctant to call it rumba. Helen's dress, that dress, all the dresses and then that dress. It's like Lilia's Candyman jive dress made ballroom. This couldn't have been anything but a delight, it's Helen doing ballroom pretending to be a crazy Hollywood legend. And Aljaz dressed as a seaman *snigger*, rather than Jack Lemon in drag. Someone should've slung this a 9. A foxtrot is hard to make exciting, and the best way to do it is old Hollywood - great work guys. Of course this kind of theme is completely acceptable as it's so in line with the mood of the original dance. This was so 'American Smooth' style it really grates with me that the show insists on having that as a separate dance, but that is a rant for another day. A great week three dance but it didn't blow me down, me hearties. He surprised us with his Charleston last week, but this was the cringe-fest we were all expecting then. Kristina did well throwing the cha cha basics in where she could, but I couldn't get over Daniel's mile-high hair! When Bruno goes off on a monologue about not committing to the dance enough you know something's gone wrong. Although like Craig says, he does have good timing, the basics are there - and he's bound to be with us for a while. I thought this had more than enough content and again, danced on 2 which Daniel did marvellously, and thus, delighted me. I mean, it was as cringe-worthy as a drunk uncle doing the moonwalk at your grandma's 80th birthday, but his timing is generally very good. Mostly I was distracted by the fact that I have been looking for a lemon yellow skirt much like the one Kristina was wearing in the routine. And by the fact that there was a rogue apostrophe on Daniel's jacket. Someone on the production team didn't pass GCSE English. Tut. So the makeup looks like a child smeared it on their faces, but Kirsty's 90s bunches are super-cute, as is the dress. After the *ahem* dogs dinner of her first couple of dances this was a definite improvement, she seemed a lot more comfortable all of a sudden. Still a bit stiff and some mistakes, but it didn't look like it was all going to come tumbling down at any point. The band did a great job of the song, by the way. It was an improvement but yet another example of how theme weeks are blooming ridiculous. This song could have been used as an homage to the movie without the crazy costumes. I can't even think of much else to say without ranting... Next week I'd like to see her improvement. Without the distraction of whiskers. I may have to rename Peter something lame like Sir Stomps-alot, I'm surprised Janette didn't get whiplash from that routine. It was pose-stomp-pose-stomp all the way through. And as Darcey said, the side-by-side section was the awkward bit because it showed Janette was dancing and Peter wasn't. Thankfully, the judges didn't shower it with 10s like I was expecting. Oh it just didn't need the pirate theme. Arrrrrrrr. Grrrrrr. Paso has its own feel that is so integral to the dance itself that forcing a theme on this dance is more of a crime than forcing it on most others. Again, the theme tune could have been used without dressing Peter as an unconvincing Jack Sparrow. If they had been able to concentrate on the actual dance rather than pretending to be pirates, perhaps it wouldn't have been so stompy and stoppy-starty. This was all a bit..meh? It was nice, probably her best dance, but there wasn't really a lot to it. In week one, they probably could have gotten away with it, but after being in the dance-off last week they had to pull out something special. Tristan's McDonalds-in-the-70s outfit was something to behold. Weirdly, weirdly overmarked. We love these two, and Jeremy looking like a bean pole in a tux, although I was worried for a Charleston. I thought Karen did a great job with the choreography for this one; it wasn't too fast, used his natural rhythm and they did a lot of the work together. And there was swivel! He actually got better as the routine went on as his confidence built and sold it all the way - long may they stay! Not one judge mentioned Jeremy's impeccable timing. His coordination isn't great but I'm convinced that movement is easier to learn than musicality. He always looks happy and at this stage in the competition, he's really selling it. They were in sync, and the choreography wasn't at all simple. Go Jezza! Anita looks lovely with a pixie cut. I have no idea what that dance was, or even if I liked it. I think Gleb tried to do a bit too much with it, was it a rumba? Was it a waltz? She randomly flew through the air at one point, was it an AS? The less said about the scary crawling the better. The technique was good and she has ballroom potential, but my least favourite of theirs so far. I'm not quite sure what was American or smooth about this. That irks me. It's not even a real dance anyway, it's a style, and if you don't do the style...well, what the hell is it? As far as Strictly is concerned, they almost use it as an umbrella term for, well, freestyle. This was danced so well, and I love Anita. But, it didn't do anything for me. I love how they finally picked a song where Jay was allowed to scowl through the whole thing, his facial expressions are one of my highlights of the year. And woah, what a jive, those kick-ball-change spinny things! A lot of content but also a lot of style. I think any ringer questions have been well and truly answered now, but it's combined with performance and that crazily intriguing face of his. OMG. This was extraordinary. He's clearly had some dance training in the past, but even so, no number of classes could buy talent like that. His technique was amazing. Yet, he danced it 'cool'. Very few of our male celebs have managed that level without 'camping it up' in order to do so. Remember how Darren Gough managed to dance a quickstep like a 'bloke' - Jay's jive wasn't on that level... it surpassed it. I know some of you on Twitter will disagree but I think this may have just toppled Jill Halfpenny as Leader of the Jive. Yes, both have things better than the other, but a dance hasn't enthralled me like this for seasons. I'm not going to grumble about early 10s. It deserved more than one. LOVED IT.